This tool defines the six elements of a strategic plan and shows their relationship and inter-dependence. This is a valuable tool to use in guiding the strategic planning process. Overview: The Six Rings Model starts with defining purpose and core values. A vision then flows from these two. Together, they form the “strategic focus” and provide a litmus test for all other decision-making. Once the strategic focus is defined, the next step is detailing the goals, objectives, and actions. Purpose: A succinct statement of why the organization exists and what it does. Core Values: Qualities essential to the organization’s success – like financial sustainability or reliability. Vision: A clear statement of a future result or end state that the organization wants to achieve. Goals: The priorities for realizing the vision, purpose, and values. Strategies: Key initiatives needed to achieve the goals. Objectives: Measurable milestones toward achieving the goals. Actions: Actions taken in support of objectives, with timelines and assignments of responsibility. Performance Measures: Measures of success tied to the strategic plan, consisting of metrics and targets. Strategic plan: A document that consolidates these elements into a coherent whole. The Six Rings Model looks the same whether you are Intel or a small start-up. The beauty of this model is that you start in the first ring and work your way outward. Each ring provides a different perspective – or lens- with which to define your company. When one ring is done you move on to the next. It’s an iterative process: the work on one ring informs the work on the others. Each successively narrows the aperture and defines the specific ways in which the organization creates value for its owners and its customers. The first three rings together form what I call the “strategic focus,” a nexus around which all activities are coordinated and organized. Will we make this product? Yes, because it’s consistent with our strategic focus. Will we enter this market? No, because it conflicts with one of our core values. In short, when you have a well-defined strategic focus, you can make sound, consistent decisions at all levels. Having the strategic focus is the first quantum leap that leaders make to build a leadership culture. Purpose is the first ring. It communicates why the organization exists. Purpose is fundamental. By clarifying purpose, you sharpen the direction of the entire organization. The test of a purpose is this: Does it tell people why the organization exists and what it fundamentally does? Is it concise and easy to understand? Does it communicate by implication what you don’t do? A company should know why it exists, right? Yet purpose can be exceedingly elusive to define. Disney and Merck have both struggled to reconcile their shareholders’ demands for quarterly profit growth with the goal of innovation, whether it be artistic excellence (Disney) or basic scientific research (Merck). Their purpose statements have provided them with needed clarity during these clashes. A purpose statement doesn’t sum up everything that the organization does. It’s just the first ring. But it needs to be very clear. Disney’s purpose is to make people happy. Southwest Airlines’ purpose is to provide low fares. That’s it. Clear and simple. There are different systems of values orbiting around us. First, we have our personal values. These are what we value most as an individual: survival, family, personal dignity, and freedom. Beyond these lie other personal work values. Some people value amassing a vast fortune. Others value public service. Some people value creativity, teamwork, or hard physical labor, while others may value intellectual activity. It’s probably safe to assume that Donald Trump holds a different set of personal values than Ralph Nader. Another layer of values are our community values. These are the things we consider important in our immediate communities. Some value development; some value green space; some value conservative politics; others value progressive politics. Orbiting around our personal and community values are cultural values. Cultural values vary greatly. Freedom of individual expression is highly valued in the United States. People in Denmark value egalitarianism. Deference to authority is valued in Saudi Arabia. Close-knit families are highly valued in Mexico. Clearly, a culture’s values permeate the people who live within it. Finally, there are the organization’s core values. When I talk about an organization’s “core values,” I’m referring to the things that are essential to its success, such as product reliability, customer satisfaction, financial success and ethical integrity. These are the values that the organization, if it could speak on its own behalf, would say are essential to its long-term success. 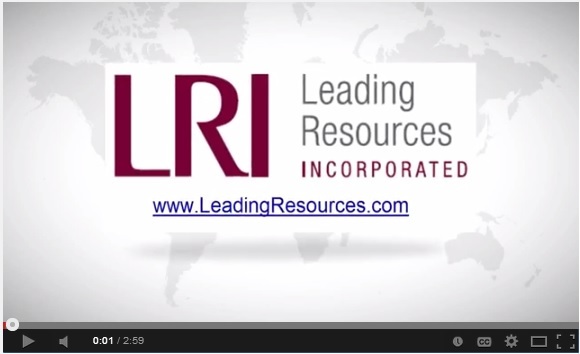 Examples of Company Core Values from Leading Resources, Inc.
A clear vision sharpens the focus. It says “here’s our direction, here’s where we’re going, here’s how we’re going to change the world.” Vision is the third ring in the Six Rings Model. Southwest Airlines’ vision is to make air travel cheaper and more convenient than auto travel. Curves’ vision is to make it affordable and easy for women to be physically fit. HSBC Bank ’s vision is to be the world’s local bank. Great leaders build trust by defining the vision. People want to know that there’s a plan and a direction. The second component is an internal vision of change. GE said it would “revolutionize the company to have the speed and agility of small enterprise.” Sony said it would “create innovative products that become pervasive around the world.” Vision needs to be linked to a clear understanding of the strengths and assets of the organization along with the opportunities in the marketplace. Often it means a dramatic shift in focus and direction. Occasionally it requires a full-scale revamping of the company’s business model. typically, it takes months to develop a fully-understood and fully-realized vision. 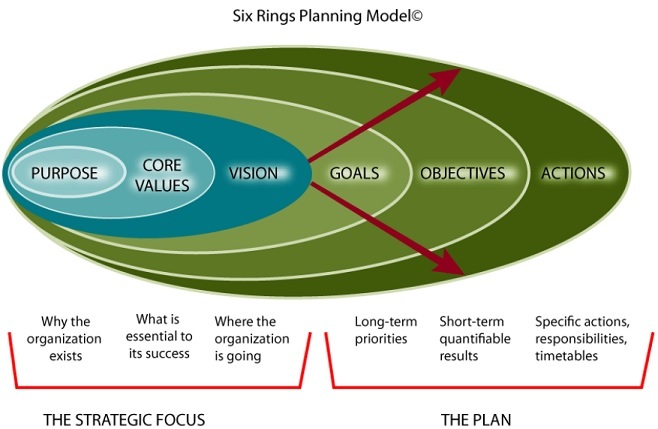 The Six Rings Model shows how to build the plan for implementing your vision. It’s divided into three parts: goals: objectives and actions. Once you’ve defined the vision, you need to define the priorities for the organization in the form of goals and objectives. I think three or four goals are plenty. More than that, people cannot absorb. Once the organization has successfully executed on those priorities, then you can introduce more. Mediocre leaders have long laundry lists of goals and priorities. This dulls people’s energies and saps the focus. One CEO had 14 goals for her company. When asked, she remarked: “It’s important to me that we have a goal that reflects everything we do.” Sharpening the focus means establishing priorities, not satisfying everyone’s pet project. How do you define priorities? If your vision is to expand into new markets, then your goals should reflect that, with related objectives of opening new offices or introducing products that will attract sales in that market. If your vision is to become more vertically integrated in the sources of production, then one goal might be to buy a manufacturing plant. What’s important is being clear about the priorities. Remember, nothing can be a priority if everything is. Objectives define the initiatives and milestones you need to hit in order to achieve the goals. Actions capture the specific steps, timetables and responsibilities for achieving the objectives. The senior leaders of the organization should take responsibility to articulate the goals. Leaders should be given responsibility to work with their departments and units to refine the goals and tie them to specific objectives and tie them to a coherent set of action steps. This “cascade” effect enables every manager – and ultimately every employee – to connect what they do to the strategic plan. Let’s track one example. The human resources department of a grocery chain listed a set of objectives for a goal related to improving customer service. Each of the actions steps was assigned to a specific individual with a specific timetable for implementation. “No,” said the store manager.